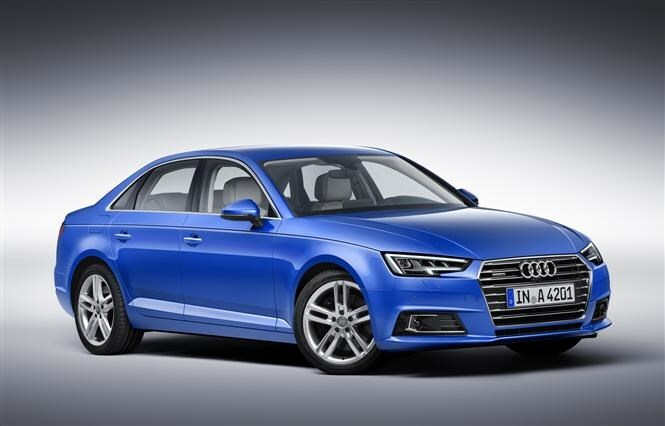 This is the fifth generation Audi A4 saloon, set to do battle with the revised BMW 3 Series, Mercedes C-Class Saloon and Jaguar XE for compact executive car honours. New technology under the skin means it’s up to 120kg lighter, 25 percent more powerful and 21 percent more efficient than the model that came before it. At launch there’s a range of petrol and diesel engines, though we can expect an Audi A3 e-tron aping petrol-electric hybrid to join the line up later in the model's lifecycle. For now the best seller is expected to be the 2-litre diesel with 148bhp, which when fitted with the firm’s Ultra technologies emits just 95g/km – meaning at time of writing, annual VED car tax will be nil. Even without the Ultra tech this engine produces just 99g/km, can achieve 74.4mpg and accelerates from 0-62mph in 8.7 seconds. There’s also a 187bhp version of the same 2-litre TDI diesel which emits just 107g/km while returning 68.9mpg and a de-tuned 2-litre TDI with 120bhp will be available later. The fastest of the range at launch is also a diesel, powered by a new 3-litre TDI with either 215bhp or 268bhp and combined economy and emissions figures of 67.3mpg with 110g/km, and 57.6mpg and 129g/km, respectively. 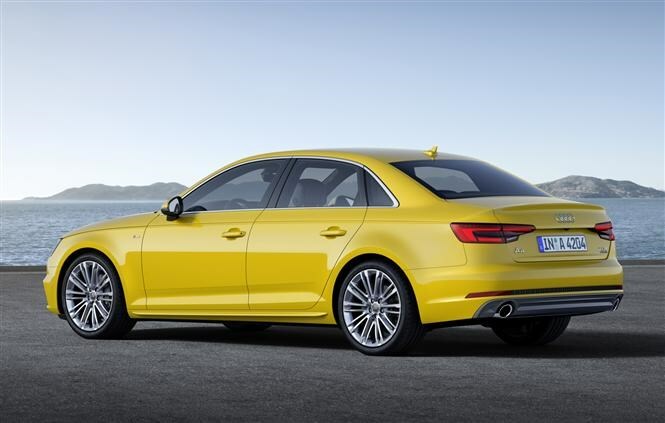 In its most powerful guise this diesel A4, with 600Nm of torque, scrabbles from 0-62mph in just 5.3 seconds and is only available with the firm’s eight-speed tiptronic automatic gearbox. Other models either get the all-new six-speed manual or seven-speed S tronic dual-clutch automatic, with the option of front- or quattro four-wheel drive. Three petrol engines are offered in the new Audi A4; a 1.4-litre TFSI with 148bhp, a 2-litre TFSI with 187bhp and a flagship 248bhp 2-litre TFSI. It’s the 187bhp version that proves most interesting though, with a new combustion method allowing the Audi A4 saloon to sprint from 0-62mph in just 7.5 seconds while emitting just 109g/km and returning 58.9mpg. 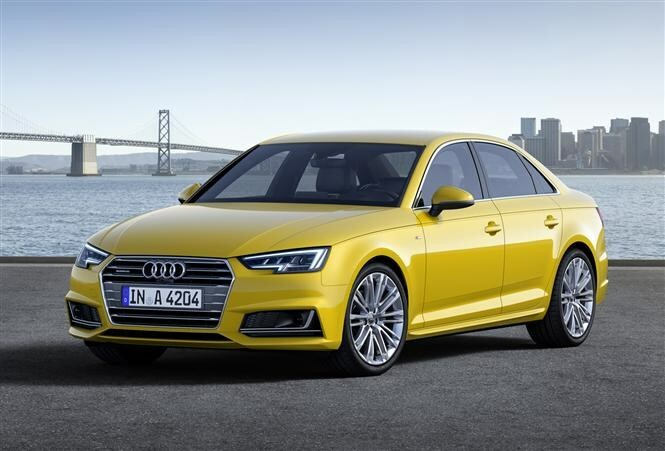 It might look familiar but this Audi A4 is an all-new design, sitting on a new 'MLB' platform, with a clamshell bonnet, single-piece grille and a double-crease line that runs all the way around the car. There are air curtains on the front bumper, to smooth airflow through and out over the front wheels – incidentally the new A4 is engineered to accept 16- to 19-inch alloy wheels – and the A4 exhibits typical Audi 1/3 glass-house and 2/3 body-side proportions for a sleek look. It’s impressively slippery too with a class-leading 0.23cd drag coefficient and it’s thanks to this that the A4 is now almost on a par with the firm’s flagship A8 for wind noise. 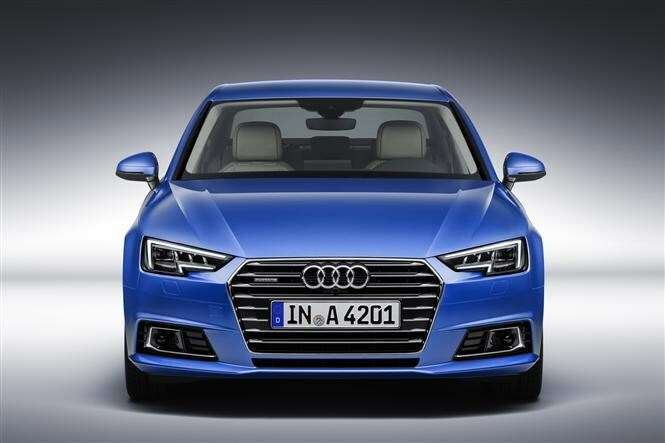 A range of headlights are available for the new A4, with a choice of standard Xenon lamps, optional LED or adaptive Matrix lights hidden behind their sharp new design. And despite the low roofline this A4 has an extra 4mm of headroom, 16mm of interior width and 23mm extra legroom in the rear seats – despite being just 25mm longer than its predecessor. 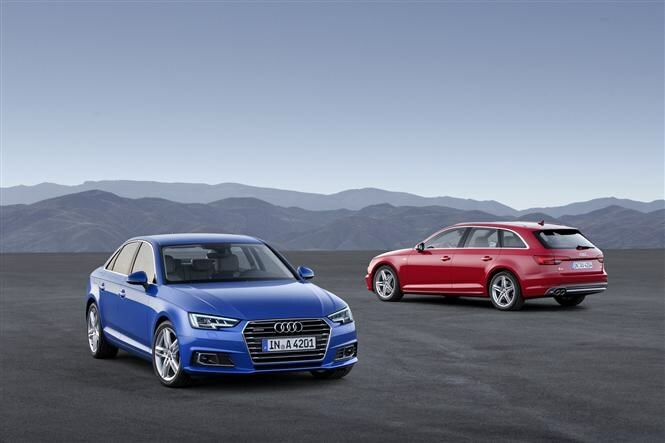 There’s a raft of new technology available on the 2015 Audi A4, some of which has been seen on other Audi models such as the TT or Q7. A new 8.3-inch Audi MMI display and touch control makes navigating through the car’s various menus easier and everyday language voice control means there’s no complicated sub-menus or commands to make a phonecall, for example. The A4 can be ordered with the firm’s Virtual Cockpit, a 12.3-inch multi-configurable LCD screen where you would normally find the main instruments, which in conjunction with MMI Navigation Plus can display Google maps and allows occupants to connect to the internet on the move. Apple’s CarPlay and Mirrorlink functionality for your smartphone are also available, as is an excellent Bang & Olufsen audio system. 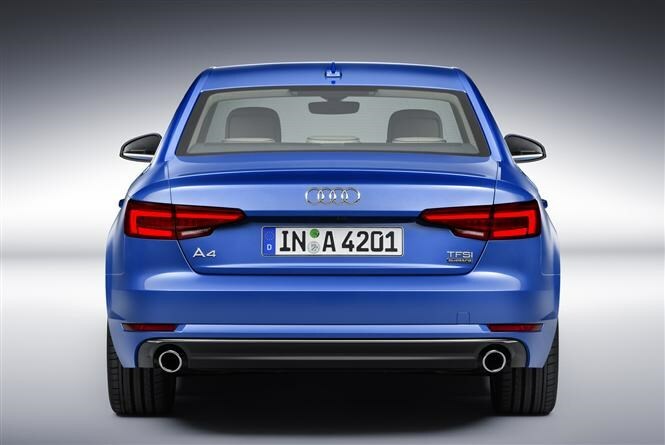 This new A4 will be available to order at the end of summer, with first deliveries later in 2015. Check back closer to the time for the full Parkers Audi A4 saloon review. We're expecting an Audi A4 Avant - or estate - version to appear in early 2016. While there's no word on faster S4 or RS 4 models at this point, if previous generations of A4 are anything to go by we won't have to wait too long to hear about them.